The secret of maximising the value of hotel loyalty points is to redeem them in ludicrously expensive places, where even the maximum possible price that the loyalty scheme can charge looks like a bargain. I doubt there is a better place to find examples of this than The Maldives. For many years, the Conrad Rangali resort, part of Hilton Honors, has been the de facto ‘best bang for your buck’. 95,000 points per night for a beach villa – which is the highest points price that Hilton Honors has for a standard reward – is a great deal given the cash rates there. One of our readers wrote a long review on Conrad Rangali for us which you can find here. The days of Conrad Rangali holding the crown for ‘best Hilton redemption’ may be up, however. There is a new kid in town. As we first mentioned last April, a new Waldorf Astoria resort has been under development for some time. 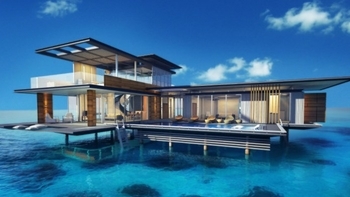 This will be called Waldorf Astoria Maldives Ithaafushi. A picture of one of the very modern overwater bungalows is above. Those of you with long memories will remember that there used to a Waldorf Astoria resort in The Maldives a few years ago but it was rebranded. The good news is that you can now book, for stays from 1st July. The bad news is that Hilton Honors has decided to break its ‘95,000 points per night’ price cap. This is understandable but could be the thin end of the wedge. Yes, it is pricing at 120,000 Hilton Honors points per night. This is not a Premium Redemption. It is clearly marked as ‘Standard Room Redemption’. Of course, in this case a ‘Standard Room’ is a 2,500 sq ft beach bungalow with a private pool. And yet …. this is exceptionally good value. To save you doing the maths, you are getting 2.12p per Hilton point. My standard Hilton Honors points valuation is 0.33p. You are getting SIX TIMES my ‘normal’ value here. You can BUY Hilton Honors points for 0.39p each in their current 100% ‘buy points’ offer here (click to read my article, click here to buy). The annual cap, including the 100% bonus, is 160,000 points per person. Some people will unfortunately see a lower 80% bonus. This is part of market testing by Hilton. Three Hilton accounts showing a 100% bonus could buy 480,000 points between them for $2,400 (£1,872). This would get you $13,101 (£10,187) of stay at the Waldorf Astoria Maldives Ithaafushi, assuming that the person booking has Hilton status and can get ‘5 nights for 4’. The relatively new Hilton ‘points pooling’ scheme which we discussed here lets you merge your points together, and the pooling limit of 2 million points per year means you can easily fit in a 5-night booking! As well as buying points, you can also transfer American Express Membership Rewards points to Hilton Honors at 1:2, or Virgin Flying Club miles at 2:3. If you want to find out more about the resort, there is an excellent promotional video which will have you rushing to build up your Hilton Honors points. The resort website is here if you want to learn more. The current ‘buy points’ offer is here. PS. Whilst this hotel is an amazing deal, even at 120,000 points, Hilton Honors has still broken its self-imposed 95,000 points hotel price cap. This could be bad news further down the road. PPS. Be aware that there is always risk in following a points buying strategy like this, or even transferring the points in from Amex or Virgin Flying Club. You need to hope the points arrive quickly. If buying, all accounts need to be targeted for the 100% bonus and not the lower 80% version which pushes up the cost. You need to hope all redemption space isn’t snapped up for dates you can make. You need to get ‘points pooling’ to work to get all the points in the same account if you want ‘5 for 4’. You need the booker to have Hilton status if you want ‘5 for 4’. If you’re flexible with dates, however, none of this should be a deal breaker. Do NOT rely on getting Avios seats to the Maldives – be prepared to pay. On the topic of Maldives, any other resort redemption recommendations anyone from Hilton / other brands? JW Marriott is about to open, there is a Park Hyatt, Jumeirah has two resorts. Re the maldives, is it me our has anyone ever wandered what happens if your on a distant atoll and there’s an emergency? I don’t just mean a natural occurrence (eg. tsunami), but also say a medical one while at the resort. The maldives has never interested me. The sea plane transfers are about the only thing I think I would look forward to! But the above has always been a niggling question in my mind – what happens when you are 40 or 50 mins away from civilisation in an emergency? Are the resorts even required to put contingency evacuation plans in place? S Sud, speaking from experience, it is also possible to be “50 minutes away from civilization” in the British Isles…. I found it rather frightening how long it took for an ambulance to get to my Mum when she was on holiday in Stiffkey in Norfolk. She swallowed a wasp and the resulting stings left her struggling to breathe. Fast forward 6 months, and my sister couldn’t come out for my Mum’s 70th back in Lincolnshire, because she was 7 months into a rather complicated pregnancy, which could have become more complicated at any minute, and she would have been an hour away (even blue lighting all the way) from a hospital that could actually give her an emergency caesarean because most maternity services have shut down at the nearest two hospitals. TripRep’s not wrong, although I’m not entirely sure that’s what he meant! S Sud – the Conrad has an onsite doctor. Any decent medical insurance would get you out on a seaplane to Male hospital or if necessary to a ME country or repatriation to UK. This issue has made me seriously consider whether I would go back to the Maldives (I definitely wouldn’t with children.) Even with a decompression chamber on the island, a diving accident would be very bad news, and there are numerous situations where an injury or serious illness wouldn’t be worth the wait for a seaplane (let alone repatriation!) I don’t have any figures for the Maldives but in Grand Cayman where an ambulance is no more than 10 minutes away and there are two state of the art hospitals, there is on average one water related death per month. Anna – here’s the article. You may remember in my reviews that the Conrad Rangali freely provide lifevests for snorkelling, in fact, on my own blog I included a photo of our group wearing them. I’ve done 2* week long liveaboard dive safaris, diving 30m, 3 times a day in some of the most remote Atolls of the Maldives. If you know what you’re doing, use nitrox and have a good crew dive guide, it’s fine. Everyone’s tolerance for risk differs, I prefer to calculate mine and mitigate accordingly. Like I mentioned previously, if you are that worried about access to emergency hospital treatment you may want to apply the same rules and avoid venturing to certain parts of the British Isles too. Is anyone having difficulty finding any availability? Thanks for the pointer! Looks great! All thanks to Headforpoints, and a bit of travel, I secured Marriott Platinum with 16 nights and recently status matched to Hilton Diamond and completed 8 stays. Booked flights to do Rio the first week in March and THEN looked at hotels. They are only typically 3 times normal price, transpires its Carnival time! Due to stays to become Marriott Platinum, accrued 100,000 points. The Rio Sheraton is 25k per night, but with the 5 four 4 deal, scored a real winner in value here! Thanks as ever Rob! I would never have known about any of this without you! Am I missing something with SPG? The Rio Sheraton is 25k points per night but the Grand Cayman Marriott is 50k (and looks rather grotty by comparison). Is this 2 separate schemes?! All prices are now in Marriotts. SPG as a hotel scheme no longer exists. But how can a 5 star hotel cost more points than a (barely) 4 star? So…presumably they stick the hotel in the highest category they think the market can bear, regardless of the quality of the property? Cayman is expensive. You go there on holiday. Anna – Would you expect a five star hotel in Hull to be more expensive than a four star hotel in Mayfair? If you stop and think about it, it’s blindingly obvious why a hotel in the Cayman Islands is more expensive than Rio – regardless of quality! I know how Cayman works, I’m just starting to work out how SPG/Marriott works! And be prepared for double currency conversion too. Go to Bermuda instead. Cayman wants to be Bermuda. BVI wants to be Cayman. Jersey – on a sunny day – is better than all three. Obviously Bermuda is north Atlantic. If you want to be Caribbean and need to be OneWorld check out AA from Miami to some of the nicer Caribbean islands. Having said that Cayman to Bahamas can be done for 4500 BA reward saver on BA widebody. I always take a light case with me. GC Marriott is right on the beach. Literally. It’s a thin hotel. And there is a nice poker joint on the other side of the main road. Hi Ralphy, hate to be the bearer of bad news the Sheraton Rio was damaged substantially last week in the storms, all public areas of the hotel and pool were completely flooded. The hotel was evacuated and is now closed. From seeing the news reports and pictures it looks unlikely to be open within the next couple of months. Check the thread on FT for more information, I’d look at make backup plans in case the hotel is not reopen by your trip. As you’re not staying she will not be eligible. What I would normally do is put her down named on the room as well as me. That way she can check in and then it would normally be passed off. If it’s pre paid leave without checking out formally, keys left in room. Always be prepared to pay in these cases though, it’s a bonus if they comp it. You are not allowed to book a paid stay for someone else under your Hilton account. Award stays only. Rookie mistake! I booked a night at an airport Hilton for my sister last year and put her as the 2nd guest – when she checked out for her very early flight they gave her 2 breakfast bags! Never say you aren’t checking in. Just let them check in as second guest, alone, then if there is a second guest just join later. You and I think alike, Tracy! On balance I’m sure many UK Hilton properties are okay with this occurring occasionally, they get extra base revenue out of it, sometimes drink + dinner, it could be very useful boost for their turnover especially during off season. Any update on the launch of a new U.K. Hilton credit card? I recall some market testing last summer but nothing since. Seeks like its completely sold out of reward avalability! If the limit is 2 people in the Beach Villa, then yes. 800k will be a super sizes villa as a Premium redemption. is there a time limit on the “5 nights for the price of 4” offer? and being gold Hilton members… do you think the “free upgrade” would apply, or is that a push too far? 5 for 4 has been going for years, don’t see it stopping anytime soon. Suspect chance of Gold upgrade is low, Lifetime Diamond and normal Diamonds (easily available with credit cards in the USA) will have priority plus I’m sure many folk will pay cash for higher category rooms anyway at this sort of resort.